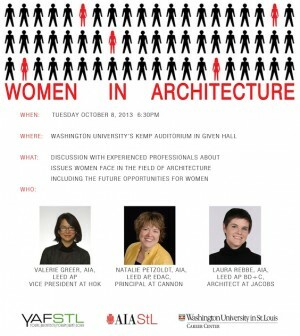 Cannon Design has announced a first-time panel discussion about and for women in architecture, organized by AIA St. Louis’s Young Architects Forum and hosted at Washington University in St. Louis. The goal for this panel discussion is to help students considering or studying the field of architecture as a profession, as well as young professionals already working in the field, to learn and draw inspiration from licensed professionals early in their careers. Panelists will discuss issues they have faced and challenges they have overcome. They will also share insights about themselves within the profession and how they see the future for women in today’s evolving field of architecture. The panel discussion is free and open to the public. Parking is available on Brookings Drive.